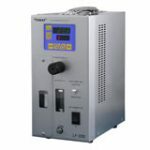 The LF-200 zirconia oxygen analyzer was developed for automatic gas filling packaging equipment based on Toray Engineering’s long track record with oxygen analyzers for the food packaging industry. This analyzer is equipped with our unique, compact zirconia sensor to enable stable and highly accurate measurement over the long term, and an oxygen sensor protection mechanism for unprecedented durability. This is an easy to operate, compact oxygen analyzer which is ideal for integration into automatic packaging equipment for foods, pharmaceuticals and other products. The system is equipped with a new type of filter to improve measurement of gases with dispersed oils. The filter can be replaced without removing the analyzer from the panel. Enables pump protection while avoiding problems due to on-site cleaning caused by blowing air. Internal pipe flow which minimizes gas stagnation at points of measurement. AC200V is provided standard, for ease of integration into packaging equipment (AC100V is optional). Toray zirconia oxygen analyzers determine oxygen concentration using the conductivity of a zirconia ceramic cell. Zirconia ceramic cells only allow oxygen ions to pass through at high temperatures. With reference gas on one side and sample gas on the other, oxygen ions move from the side with the highest concentration of oxygen to that with the lowest concentration. The movement of ions generates an EMF (Electro Motive Force) which can be measured to determine the oxygen content. This is in accordance with the Nernst equation. Must not contain flammable components, halogen, silica, corrosive components or water droplets. Pressure: Pressurized at 0.03 MPa max.